If you’ve ever considered commissioning a custom-built superyacht then you’ll be aware of the lengthy wait times. Two to three years is common for a yacht around 50 metres while the complexities involved in building a yacht of 80 metres or more could see you waiting for your dream vessel for up to six years. But, thanks to Burgess, there is a way to jump the queue. The brokerage house currently has two yachts on its books – the 54.4 metre Majesty 175 and the 84 metre Icon 280 – that are in-build and will be ready for delivery to potential owners in a fraction of the usual build time, meaning you could be sailing into the sunset on your maiden voyage far sooner than you think. So which one is right for you? For the truly impatient, completion on the beautiful Majesty 175 is expected by the end of 2019. The new flagship from UAE-based yard Gulf Craft, she features world-class naval architecture by Massimo Gregory at the Yankee Delta Design Studio and boasts a 780GT tri-deck design with a trans-Atlantic range of 4,000 nautical miles. Exterior and interior design, meanwhile, has been undertaken by Christiano Gatto with much emphasis put on impressive lounging and entertainment spaces. Of particular note are a large beach club aft complemented by a foredeck pool and an upper deck hot tub providing a myriad of options for relaxation al fresco. Inside, the Majesty 175 offers seven spacious cabins, including an owner’s suite on the upper deck and two VIP cabins on the main deck, while all interior spaces benefit from a modern, airy atmosphere thanks to large windows allowing in plenty of natural light. If you’re after something a little bigger, and don’t mind waiting a touch longer, the incredible Icon 280 will be ready for delivery in around two years. Designed by the legendary Tim Heywood, the yacht boasts timeless, elegant naval architecture by Van Oossanen combined with cutting-edge technology and unparalleled craftsmanship. Arranged over five decks, the Icon 280 can accommodate 19 guests in seven cabins including a stunning full beam master suite with huge en suite and dressing rooms forward on the upper deck and a VIP cabin on the main deck, all designed by Gimena Mazzeo design. However, should you have a preferred designer in mind then the yacht can be customised to your requirements. The mammoth 2,410GT of the Icon 280 also allows for a vast array of bonus rooms, including a wine tasting bar and cinema aft of the wheelhouse, a formal dining room, large lower deck spa with sauna and hammam and an aft gym with unbeatable ocean views across a side-opening sea terrace. Of course, outside spaces have been planned with just as much care. The transom opens to reveal a tranquil beach club with direct access to the vast aft bathing platform while the main deck is home to a large infinity pool as well as a forward helideck and lounging area. The impressive sun deck with jacuzzi is just one of numerous spaces primed for sun worshippers – and can also host up to 200 for fabulous parties – while the upper deck also offers a relaxed spotted for outdoor dining. 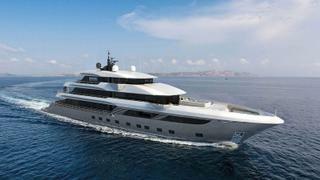 A unique chance to own an exquisite new superyacht without the wait, if one of these projects sounds like the perfect vessel for you, head to burgessyachts.com to make an enquiry now.